I'm going to have a series of posts about what I saw during my recent trip to the California Spring (aka pack) trials. The focus of the trials is annuals, so today is a run down of the ones that caught my eye. I'll follow up with perennials, with some more general thoughts on the State of Plant Breeding Today, and What I Thought of California to come. I'm not a huge petunia fan (despite the fact I work with them) but I couldn't resist taking a picture of this petunia 'Cappuchino' from Dummen. Such an unusual color! 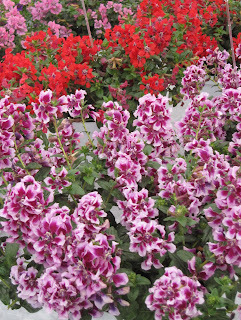 Nemesia seems to be a rising trend, we saw TONS of them. 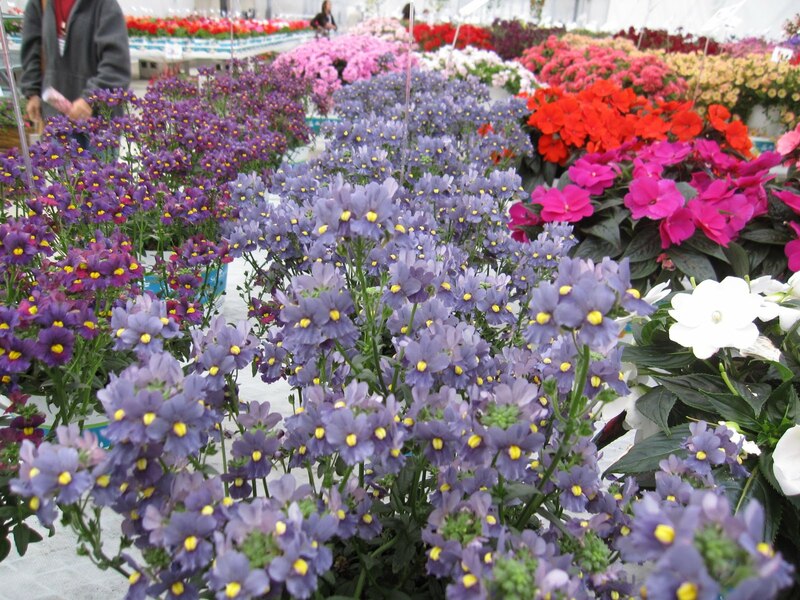 My favorite was this 'Metallic Blue' I think nemesia are lovely, but they've never performed well for me. It will be interesting to see if some of this glut of new varieties hold up better to the heat. Cuphea seem to be moving into the mainstream. 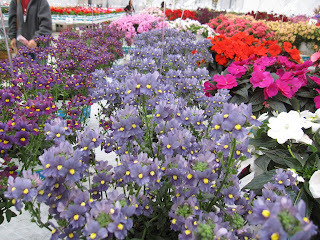 Several companies had new cupheas with HUGE flowers. Not sure how much I like them, but they are a nice change from the endless petunias and geraniums. 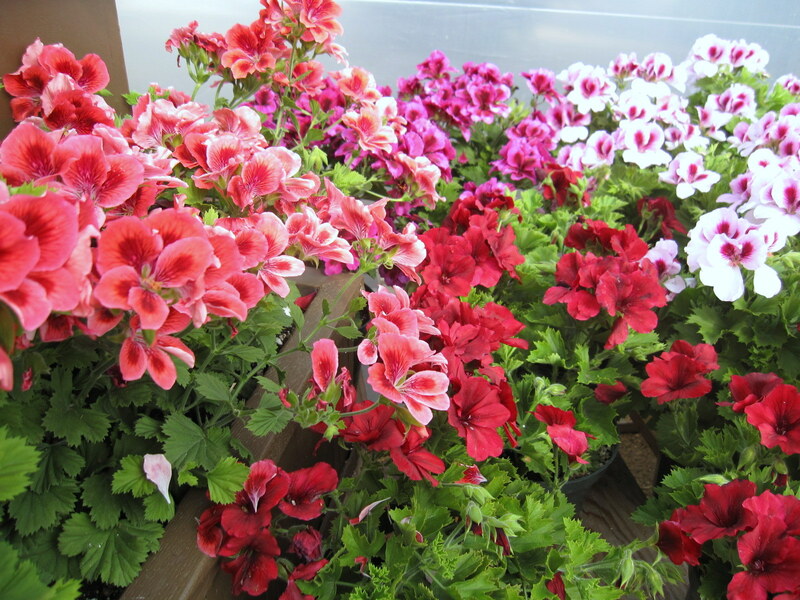 Another trend I am very happy about are the regal-type Pelargoniums (aka, geraniums). Regals are spectacularly beautiful with huge, bicolored flowers, but are notorious picky and hate heat. 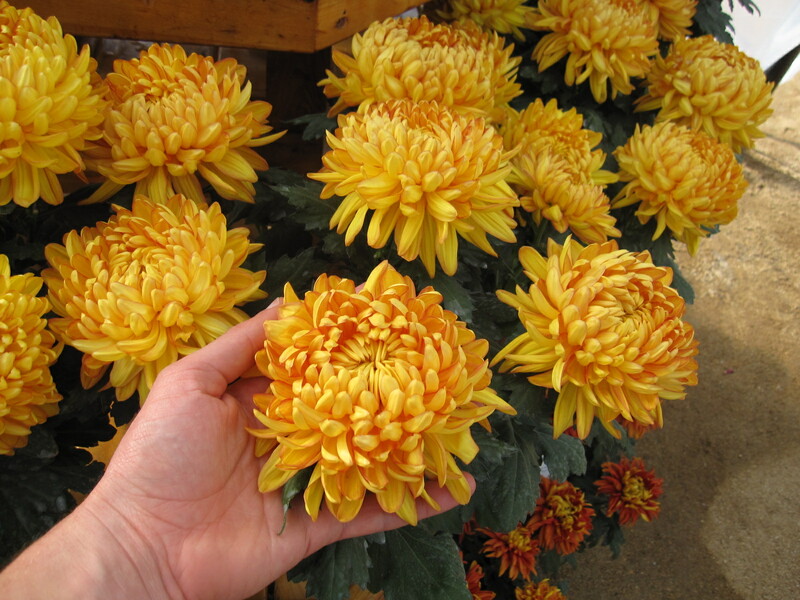 Many companies we visited had new series of regals they claimed were more heat tolerant and better performers. I hope they are right. I'd LOVE to see these types replace the boring old zonals. 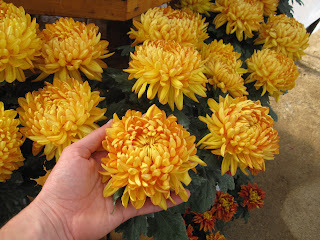 I'm not much for standard cushion mums, but I really liked these mums: Just a few flowers on each plant, but each on the size of my hand! I really hope these catch on. Nice pictures. 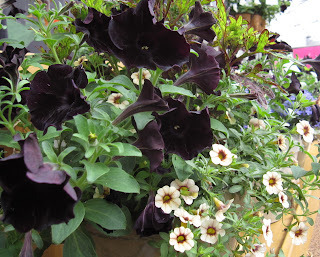 I know I'll be seeing petunia 'Cappuchino' (at least) at work. I've already got a few plant combinations in mind that I hope can work well with it but it seems like it's got hints of bronze, pink and yellow in there? I may actually give that one a try at home even though I'm generally not a huge fan of them either. I'm hoping I'll be seeing that black one as well. 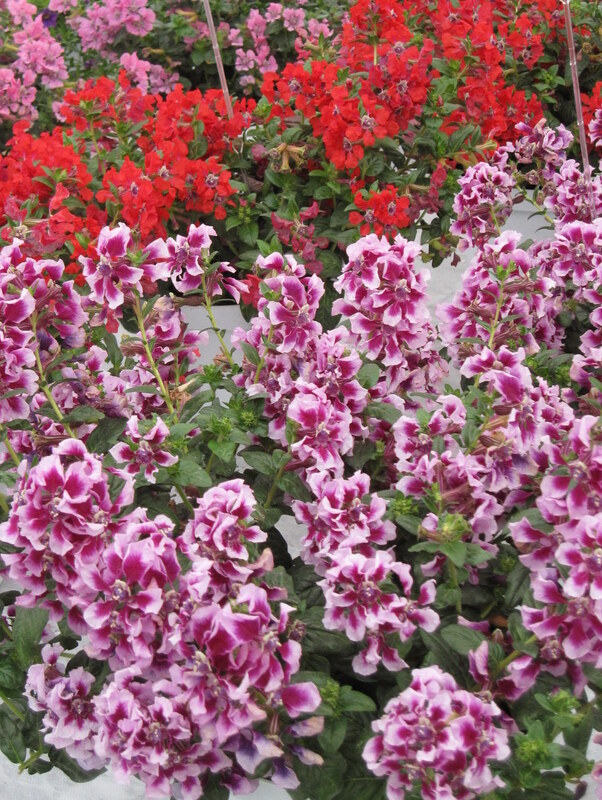 I don't know what it is with Nemesia and Cuphea both, but we struggled to even keep our stock of both alive at work the last two years, much less have them in presentable form to sell. The Nemesia finally wound up on the planta non grata list as of this year, or so I've been told. I think you can expect to see the black petunias everywhere... Ball is a major company, and they were making a HUGE fuss about them. Mr. S. Yeah, Nemesia is kinda a whimp. I've never had trouble with cuphea, but I don't know about these newer cultivars. The Cuphea bloomed fine; they were a problem because the leaves turned lumpy, with light spots at the top of each lump. I think I still have pictures somewhere. When it got bad enough, we threw them out, though now that I think about it, I don't think very many of them actually died on their own. They probably would have straightened out just fine in someone's yard or container or whatever, but they looked so miserable that nobody would buy them to find out. 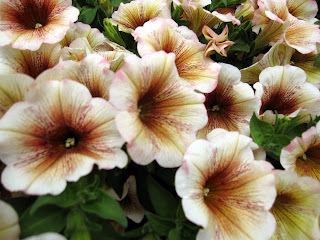 It seemed like edema, but we didn't have a good way to water them separately, the way things were set up, and even when we took a couple plants elsewhere and tried, the problem still happened. This is the best part of the season in which we are able to see the true beauty of nature around us. That is the only reason spring has always been the favorite season to every person. For the first time I have seen such amazing flowers that seems to be pretty rare to be seen at every place. The temperature and atmosphere is supposed to be in the accurate post. Plants are always attractive and beautiful parts of any building, park, house and school, so you cannot think to live without plants. In this article you may learn about assignment writing help plants so much, as we know there are so many types of plants. I am Olivia Crew, SEO Expert in a reputed company livewebtutors. Nice pictures. I love it thanks for shring. Excellent blog post.. If you searching for myassignment help services then hire our experts assignment helper in all over world. Good effort by the author and posted great content for the users. We are proud of our best online assignment writing help Australia experts because of their dedication towards providing continuous support to students by helping them meet deadlines and scoring better grades. We understand how important academic assessments are in developing a student's career and future opportunities, this is why we take extreme measures to ensure that all our solutions are best-in-class. Apart from the aforementioned universities, our Australian University Assignment help experts have also catered to significant number of assignment requests from Victoria University, University of Wollongong, Griffith University, James Cook University, Deakin University, Central University, Curtin University, UNISA, QUT and many others. To all those students who are in a constant farrago of queries such as "can anyone write my assignment in Australia?” etc., we can prove worthy with multiple service benefits of ours. You got it correct! Cheapest mba essay writing services is here by @GotoEssayHelp. Just submit your essay and get rid of your MBA essay right now. Take help from professional experts available 24*7. Low in budget-High in demand. Get your nursing essay help online from the cheapest and top quality nursing essay writing service providers. Thanks for the informative article. This is one of the best resources I have found in quite some time. Nicely written and great info.